URLs to SL Exchange, OnRez, etc. I’ll probably do this as a wiki eventually so creators can add and update their own entries, but I’d like to get this kicked off, so until I find a site that works for me, please enter the above information in the comments. Don’t just limit yourself to your own stores. Add some of your favorites. The goal is this will be open and editable eventually, but I’d like to start with some stores already in there. So I’m crowd sourcing :). Help me get these listed. Images can be sent to me at NurseTanyaBook@gmail.com Thanks everyone! I was playing around with the Christmas bag from Cassini Creations. It’s lots of fun. Just click on it and it brings up a list of everyone within 20m of your avatar. Click on the name of the avatar you want and it asks them if they have been naughty or nice. Once they respond they will get a random gift or a lump of coal. I seem to have overlooked one award on the last posting. It was the People’s Choice Award. It’s here! The results. I decided to list the winner (or winners in case of a few ties) and then the 4 closest runners up. 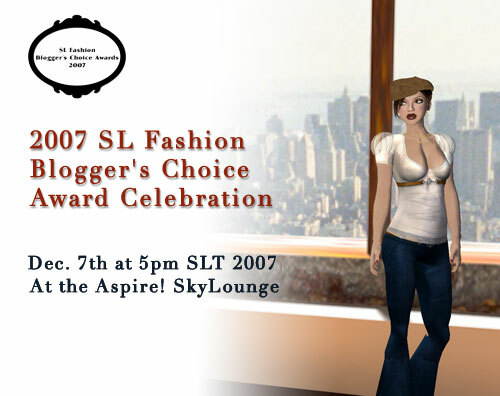 Hey everyone we’ve had a location change for the 2007 SL Fashion Blogger’s Choice Awards Celebration. It will be hosted at the Aspire! SkyLounge and our DJ will be Summer Deadlight. Be sure to join the event page on Facebook for photos and more after the party as well as any other event changes. So I’ve been tagged by Tanya and Iris Seale. 1. I’m not Tanya’s alt. Seriously, when I first started blogging she got a couple of compliments on me. 2. A lot of my energy lately has been going into World of Warcrack. 3. The last 2 years have been one thing after another offline and it’s not over yet. Lots of illnesses, two deaths, and tons of depression. You guys may never recognize me if I’m ever normal again. 4. I wasn’t really interested in fashion until I got into Second Life. 5. I’m technically left-handed because I write and do most things with it but I also do a lot with my right so I’m fairly ambidextrous. 7. I love it when you come up and talk to me. I’m an extreme introvert so I don’t get out much even in SL and I often feel like I’m intruding when I see other people I might say hi to. 8. I’m moving to Atlanta after Christmas to go back to school for design. In the meanwhile I’m hanging out my shingle at http://infoadept.com. I’d loooove feedback. 8 people to tag, huh: Amelia Abernathy, Ayesha Bisiani, CronoCloud Creeggan, elka Lehane, Lucas Lameth, Roslin Petion, CJ Carnot, Caliah Lyon. Yes I can count but a couple of them have probably already been tagged. 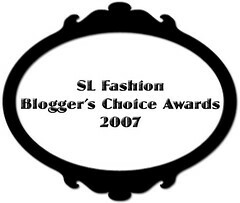 You are currently browsing the Fun category at SL Fashion Notes.